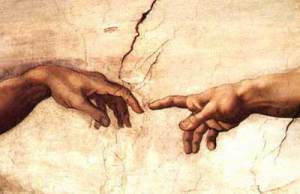 There are only two ways to interpret the phrase “The Right Hand of God”, literally or figuratively. Many have fallen into the error of taking the phrase “The Right Hand of God” literally. When they hear the phrase, they picture in their mind, Jesus Christ seated on the right side of God. The question becomes is that the correct way to view this phrase. Does it mean that one divine person is on the right side of another divine person? Was the phrase “right hand” used in other places in the Bible? The answer is yes. One good example is when the children of Israel were crossing the Red Sea being pursued by Pharaoh’s army. A song was begun by all which we find in Exodus chapter fifteen. “Thy right hand, O Lord, is become glorious in power: thy right hand, O Lord, hath dashed in pieces the enemy” (Exodus 15:6 KJV). What did the children of Israel see? Did they see the literally right hand of the Lord?